[prMac.com] Fremont, California - .com Solutions Inc. has released FmPro Migrator Platinum Edition 7.01 with support for Find Requests to the PHP conversion feature. Users may Add, Delete, Modify or Restore previously executed Find Requests from the navigation toolbar. Many FileMaker users make use of sophisticated Find Requests when performing searches. The addition of this enhancement to the generated PHP web application makes this functionality available with every supported SQL database server within a scalable PHP web application. 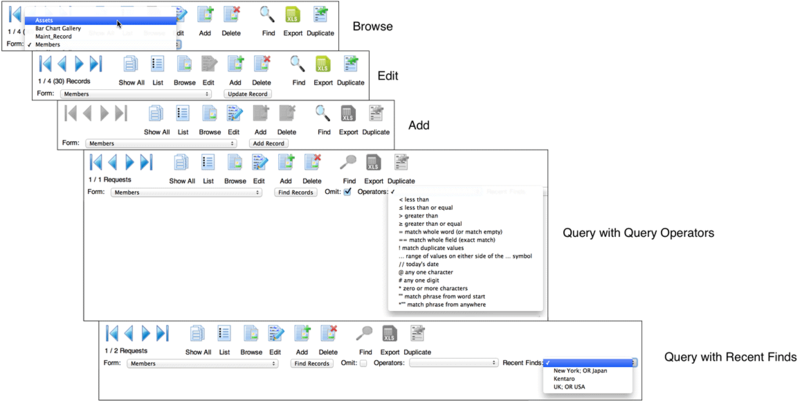 The Query toolbar includes support for creating and managing any number of Find Requests. Clicking the Add or Delete buttons will adds or delete a Find Request. Previous finds are listed in the Recent Finds menu. Selecting a Recent Find from the menu re-populates the fields with the previous values, where they are available for further editing or immediately searching by clicking the Find Records button. Clicking the First, Previous, Next, Previous, Last buttons on the Query toolbar provides navigation between multiple Find Requests for editing. * The addition of an "** Admin **" option to the navigation toolbar list of converted forms to allow users to navigate back to the Admin page. /admin is now recognized in the routes.php file along with /default to redirect back to the admin page of the application. * Updated the core.php file to write SESSION info into the /tmp directory for the application instead of using the default PHP sessions in the web server /tmp directory. This change improves SESSION handling by making certain that each CakePHP application manages its own SESSION variables to avoid naming conflicts between multiple applications running on the same web server. * Updated the LiveCode icons on the GUI tab to use the new LiveCode Community Edition icon and logo. Projects can be converted for both LiveCode Community Edition and LiveCode Commercial Editions with FmPro Migrator Platinum Edition. * Updated the AccessDDRExport to v2.7 with Access to FileMaker form/report image handling improvements. The supplied AccessDDRExport27.accde/AccessDDRExport27.mde files are unlocked in order to enable localization and other changes as needed by customers. These Access database files can be edited by simply changing the filename from accde => accdb or .mde => .mdb. FmPro Migrator Platinum Edition is priced at ($600 USD) per developer and includes a copy of FmPro Migrator Platinum Edition for both MacOS X (Universal Binary) and Windows platforms. Existing FmPro Migrator Developer Edition customers may upgrade to FmPro Migrator Platinum Edition for $400. Founded in 1999 by David Simpson in Sunny California, .com Solutions Inc. develops multi-platform graphical applications supporting FileMaker Pro, SQLite, Oracle, MySQL, Access, SQL Server, Sybase, DB2, OpenBase, PostgreSQL, FrontBase, Valentina, VB6, LiveCode and Visual FoxPro developers. FmPro Script Diff, compares and edits FileMaker Pro scripts. SQLite Diff compares SQLite database schema and data. Copyright (C) 1999-2013 .com Solutions Inc. All Rights Reserved. Apple, the Apple logo and Mac OS X platforms are trademarks of Apple Inc. in the U.S. and/or other countries. "We've been using prMac since our very first press release, which introduced Pixelmator 1.0. We've tried out many similar services along the way, but we still publish news about every single Pixelmator update via prMac as well. For one, we are very happy with its Mac-related media coverage. Secondly, the guys at prMac have been most helpful. They usually reply within a few hours, which is invaluable when distributing news. And finally, prMac is really easy-to-use, so it takes just a couple of minutes to ship a message. With that said, we intend to continue using prMac for the upcoming decade." Marija Mikalauskiene - Pixelmator Team Ltd.